St Albans Abbey Girls Choir was formed in 1996 and consists of up to 26 girls between the ages of 8 and 14. The choir sings Evensong twice a week, and the girls are drawn from many local schools. The girls rehearse three times each week, before or after school. For certain weekend services and other events, the girls sing with the Lay Clerks, the men of the Cathedral Choir. The choir is regarded as one of the finest ensembles of its type in the UK, and has made a number of CD recordings including releases on the Naxos label of music by Felix Mendelssohn (2012) and William Mathias (2016). 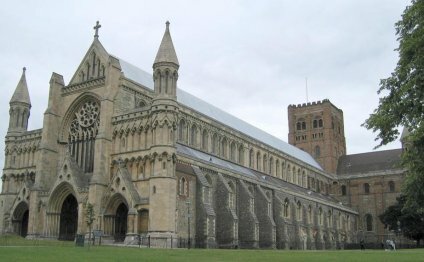 The choir has also joined with St Albans Cathedral Choir, for two recordings of music by John Rutter. The choir has made concert tours to the USA, Ireland and Denmark, and will be visiting Paris in 2016. Performances closer to home have included a concert in the City of London Festival, Duruflé’s Requiem in the St Albans International Organ Festival, and John Rutter’s Christmas Concerts at the Royal Albert Hall. The choir has also sung services at St Paul’s Cathedral, London and Westminster Cathedral. In 2016 the choir will be featured on the BBC’s Songs of Praise. Girls are usually admitted to the choir from the age of eight (school Year 4) and remain in the choir to the end of the summer term of their fourteenth birthday (school Year 9). Auditions are usually held in late April. For more information about the choir’s schedule please click here.